She is a 500cc Royal Enfield Bullet. This is an important introduction because if you read my posts you will be hearing a lot about me and Bala over the next 8 months or so. Finding each other is the beginning of an adventure that will take us both across India and all the way to Spain, through 20 countries. (For more details about the travel plan CLICK HERE) For roughly ten to twelve thousand miles (16,000-19,000 kilometers) she will be my travel companion, my trusty steed, my Rocinante. She was born in India in the 70’s (Never ask a lady her exact age) but the engine that powers her is of an engineering design that has basically not changed since the 1950’s. No fancy technology, no fuel injection, just one big hog of a cylinder surrounded by cast iron. Is a motorcycle that was engineered over 60 years ago a practical choice to drive from India to Spain…over mountains, through rivers, across deserts? No. Not at all. Will she break down? Yep. Do I know heaps about mechanics? Nope. Will it be hard? For sure. Is it even possible? I’m about to find out. Her name, Bala, is an old Hindi/Sanskrit name that means “powerful”. Coincidentally it also means “bullet” in Spanish. So she carries in her name something of her origin as well as of the place she will eventually call home. She’s going through a punk phase now but before we leave India she will get a complete makeover and paint-job. When you begin a long and challenging adventure with someone, you learn to love that person, to depend on them for company, for support and for encouragement. You also sometimes want to kick them in the arse and leave them on the side of the road. And so it goes with Bala and I. She’s a firecracker. She’s a rock. She’s an incorrigible teenager, a sassy old lady, and an attention seeker. She is loud and demanding, determined and loyal, obstinate and argumentative. She is Marilyn Monroe AND James Dean. But most importantly she is adventurous and she is up for the challenge. How did we meet? Luck. 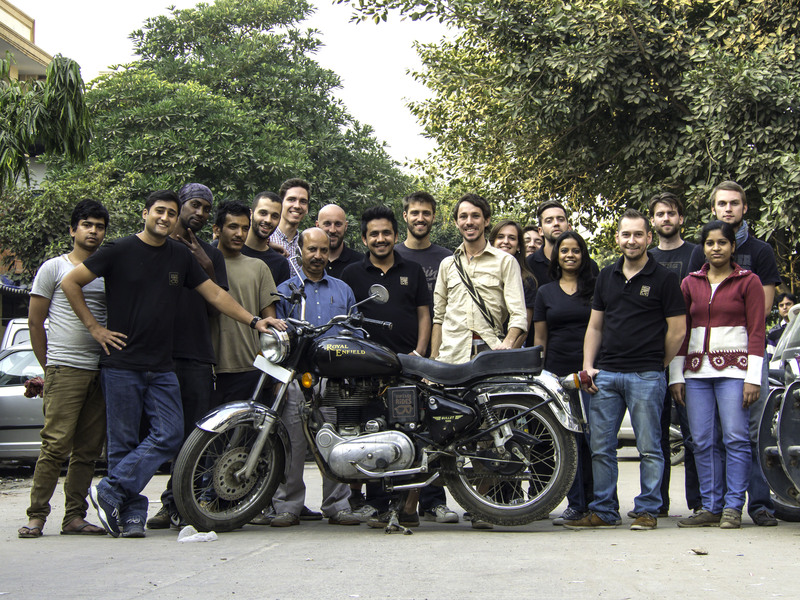 I was at the end of my patience in Delhi searching for a worthy motorcycle and honest mechanic when I finally found both in the form of a bunch of Frenchmen (and women) who had gotten lost on the way to their local Patisserie and found themselves in India operating a motorcycle tour company called Vintage Rides. They were more excited about my crazy plans than they were about trying to sell me a bike. True enthusiasts. They went the extra distance and spent weeks with me helping me plan my route, giving me mechanics lessons, and helping to modify Bala to be ready for such an endeavor. I don’t know how to thank them for all the help that they gave me but this modest shout-out is a start. And so, the adventure begins…or perhaps I should say continues. For those who don’t want to miss any of my updates you should subscribe to my blog, you can do that by entering your email on the right side of this blog under where it says “Email Subscription” (Make sure to confirm your subscription by opening the email that will be sent to you). 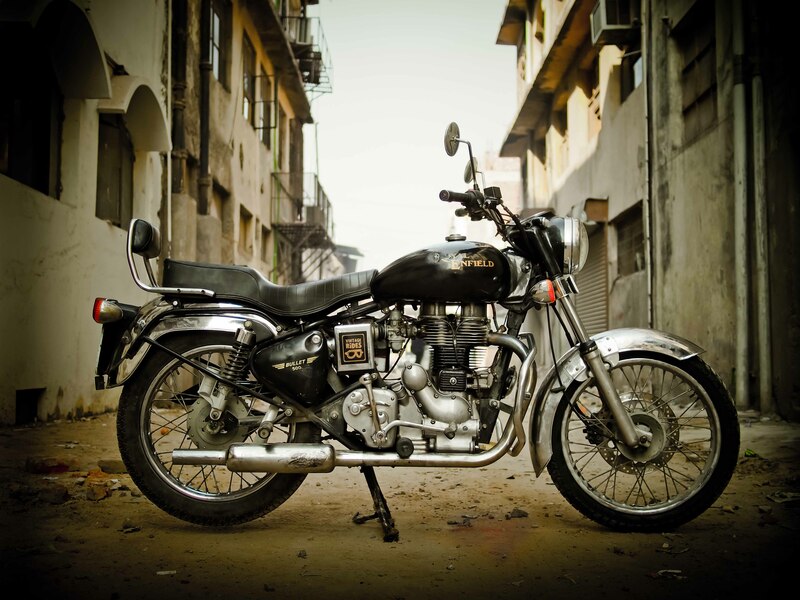 This entry was posted in Uncategorized and tagged bullet, buying a motorcycle in india, buying a motorcycle in new delhi, india, motorcycle india, motorcycle tours india, motorcycle tours new delhi, royal enfield, royal enfield bullet, vintage rides, vintage rides india on December 7, 2013 by Jordan.